In recent years, jihadist groups have turned to several social media platforms such as Facebook, twitter, instagram, etc. to disperse their messages to the world. These messages have the goal of spreading the idea of the groups’ supremacy and overall righteousness to others in the social media cyber-sphere. Muslims and non-Muslims alike view the various pieces of propaganda, whether in print or video, that are meant to both instill fear into “non-Believers” and also encourage others to come and join the cause. However, the various jihadi groups do compete with each other, often condemning each other’s actions, humiliating each other via videos and pictures, and threatening one another with violent action. While dispersing propaganda is one of the main goals of thee groups, they also use the social media platforms for intra-group communication. Members will often post videos or pictures of martyred fighters who have been killed in battle or in suicide operations. Fighters will report on battles using videos, pictures, and written statements detailing what is transpiring at the location, where forces are stationed, what weapons are being used, and the effects of different attacks. Lastly, the groups use social media to inform members of various rules and publish guides for members. Guides regarding the use of social media platforms clandestinely, VPNs, and secure mobile networks are circulated throughout jihadist networks. Using social media helps terrorist networks stay informed on various tactics and on-going operations in conflict zones and abroad while advancing efforts to recruit fighters and discredit rival groups. Recently, the Islamic State (ISIS) has become the main voice of jihadist discourse on Twitter. This article will examine recent ISIS Twitter activity and its implications on the group’s efforts to recruit and expand. The Islamic State of Iraq and Syria has started using social media website Twitter as its main platform for online networking and diffusion of group propaganda. Twitter has proven to be an effective platform for ISIS’s Internet campaign as the nature of the website allows ISIS supporters to create and follow an unlimited number of accounts. Even if an account gets blocked or deleted, users can simply make a new one, often adding a number to the end of their prior Twitter handle, thus making it easy for group sympathizes to reconnect. Islamic State sympathizer Abu al-Qacem “Sfaxian,” for example, is currently posting on his 45th account. Al-Qacem’s current Twitter handle is @qacem45_sfax. His handle prior to his last suspension was @qacem44_sfax. Once accounts like al-Qacem’s are suspended, other sympathizers flood Twitter with posts publicizing that person’s newest handle. Although effective in allowing ISIS supporters to avoid permanent suspension from the Internet, the decentralized nature of Twitter also presents operational challenges for the Islamic State. The sheer multitude of ISIS supporters on Twitter makes coordination between users basically impossible. Amateur Islamic State supporters often post information that can compromise ISIS operations, forgetting that anything available to ISIS supporters is also available to intelligence organizations and groups fighting the Islamic State. Incidents like these have resulted in a number of recent posts outlining “rules” for ISIS sympathizers on Twitter. One prominent account similarly asked sympathizers to refrain from posting information about current battles without the prior permission of ISIS “mujahedeen,” asserting that twitter posts were endangering ISIS fighters in Fallujah and Samara, Iraq. One of the main ways ISIS uses social media platforms such as Twitter is disseminating information regarding cyber-warfare and security. ISIS recognizes that today’s warfare also exists in cyberspace. As such, they want their fighters to be protected and smart while using Internet-capable and mobile devices. Many different accounts disperse information through ISIS ranks encouraging the use of safe, anonymous browsers like Tor, Open Door, and Kaspersky to prevent traces and to open accounts on social media platforms such as Twitter without using a phone number. 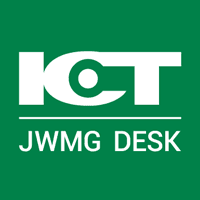 Others posts describe how fighters should download identity protection software for their mobile devices or use a VPN update that will increase internet security on their phones. ISIS cannot afford for their fighters and leaders to get hacked continuously by other governments and agencies who can then use geo-positioning information to determine troop movements, battle plans, and other information that would hurt ISIS on the battlefield. In addition to information regarding cyber-security, ISIS members also post information regarding ISIS cyber-attacks. One such account, @Hacker Aldmar boasts of his accomplishments quite frequently which include hacking 1000 Iranian emails, the Iranian Health Ministry, Aramco, and the Burmese Government Website. Though these attacks can be minor and website are restored quite quickly, they often show a black page filled with Quranic verses and the ISIS flag pictured near the top of the page. Another example of this pride is ISIS members disseminating information regarding the recent ISIS hacking of the Malaysian Police website. In doing so, not only does ISIS instill morale in its fighters but also shows how powerful and wide reaching of an organization it is in terms of cyber capabilities and lethality. Social media is the best way to engage with would-be jihadists around the world. Since many people use platforms such as Twitter and Facebook, these groups have the ability to reach out to thousands of people by dispersing their messages and videos in the hopes of influencing others to join their jihadi groups. On Twitter, groups such as ISIS are very aware of their social media presence and influence and thus use it quite extensively for recruitment purposes. ISIS will often post pictures of life in ISIS-controlled regions in hopes of exposing the “truth” to the outside world. Professionally manufactured picture pamphlets titled “Life in Wilayat Nineveh” or “Mosul at Night” show images of people laughing, enjoying ice cream, and shopping in the markets. Other pictures titled “Road Service Project in Wilayat Dijlah” or videos titled “Zakat During Ramadan” are meant to demonstrate the care and concern ISIS has for the people and regions under its control. During Ramadan, ISIS was very keen to post pictures of the many mosque-goers praying, along with images from Iftar meals at night showing smiling, happy people. They even posted an image of them opening up a sweets shop in Wilayat Tarablus for the post-fast meals. ISIS recognizes the image with which the Western world has branded them. They know many people see them as being a monstruous, brutal terrorist group. In hopes of changing that image, they have engaged in a public relations campaign, at least in cyberspace, to show “what life is really like” under their rule. Along with humanizing the organization, ISIS propaganda adheres to a strict religiously-oriented recruitment framework. Videos in which they show executions of prisoners and soldiers come with a religious overtone promoting the victims as “apostates or “kufar” who deserve to be killed based on Quranic interpretation. Moreover, ISIS fighters often post lines from the Quran or other religious texts that are meant to validate ISIS’ existence and violent actions. A recent post from a fighter used an Islamic religious text from Albania concerning the Mahdi, or Islamic Messiah, to justify the ISIS caliphate and the rule of Abu Bakr al-Baghdadi. Furthermore, a recent news story in which dozens of Tunisians from the Ramada neighborhood in Tatawin, Tunisia vacated their houses for ISIS controlled regions of Libya was framed through a religious lens on social media. ISIS posts proclaimed how this was the call to the caliphate, as the Quran dictates will happen during the Days of Judgment, as people are literally uprooting themselves to live in the caliphate and observe Shari’a law. Competition among terrorist groups is ever-present in conflict zones as they try to convince supporters and would-be jihadists alike of the righteousness of their cause and their effectiveness as a fighting force. Recently, ISIS has been butting heads with noted Gazan Palestinian terrorist group Hamas. Hamas, whose 2014 war with Israel left it in many ways crippled and with a lack of Palestinian support, has been struggling to maintain support as Salafi and ISIS elements in the Gaza Strip have undertaken operations against Israel in hopes of renewing the conflict. To curb these groups and preserve the negotiated ceasefire, Hamas has arrested and even executed several noted Salafi leaders and ISIS-allied citizens, which has caused an uproar in religious communities specifically in the Gaza Strip. News of these acts has spread, however, and ISIS, which subscribes to a brand of Salafi jihad, views these acts as un-Islamic. Members, through videos and posts on Twitter, have directly condemned Hamas’ behavior and warn them of their impending destruction if they continue to violate Shari’a law and attack ISIS and Salafi elements. The posts particularly attack Hamas for being allied with Iran, which ISIS hates due to their Shiite brand of Islam, their ineffectiveness against the Israeli army, and their lack of adherence to Shari’a law. Most recently, posts refer to the killing of two youths during Friday prayer for pro-ISIS statements, the imprisonment of Salafi leaders, as well as the demolition of two Salafi-oriented mosques. A Hamas hashtag has even circulated through ISIS-linked Twitter profiles in hopes of instilling fear in Hamas leadership. @HackerAldmar, as discussed above, hacked Ramco and Al-Quds Media Outlet, two Hamas linked organizations as a means of showing ISIS seriousness when it comes to dealing with Hamas’ abuses against them. Like Hamas, the Afghan Taliban has similarly drawn heavy criticism from ISIS sympathizers on Twitter. The Islamic State is now trying to take advantage of the chaotic situation in Afghanistan by expanding its presence in the area. Seeing the Taliban as its biggest threat to expansion in Afghanistan, the Islamic State has launched an all-out “offensive” on Twitter to discredit its Afghan rival. The Islamic State’s Afghan Twitter campaign has focused on discrediting Taliban forces while broadcasting the group’s “rapid expansion” in the area. With regards to the former, recent ISIS discourse on Twitter has tried to assert connections between the Afghan Taliban and the Pakistani Inter-Services Intelligence Directorate (ISI). A post on July 12th by prominent ISIS sympathizer account @abutalut4 stated that Taliban commander Abdul Jabbar had ordered his forces to protect Pakistani interests in the area. Similar posts accused Jabbar of being an ISI informant and the one behind the Taliban’s recent peace talks with the Afghan government. ISIS sympathizers have also tried to present their group as the area’s “most-Islamic” force, and a viable alternative to Afghan national rule. While trying to discredit the Taliban’s religious and operational authority, the Islamic State has similarly worked to broadcast its “expansion” into Afghanistan by publicizing pledges of allegiance from regional groups. 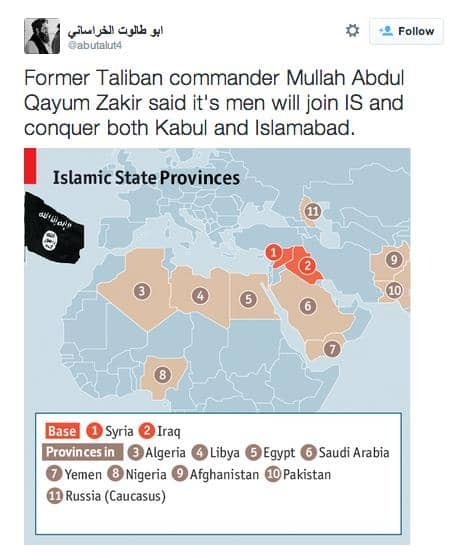 On July 10th, @abutalut4 praised former Taliban commander Mullah Abdul Qayum Zakir for joining the Islamic State. A couple weeks earlier ISIS affiliated Twitter accounts widely publicized the Islamic Movement of Uzbekistan’s (a militant group operating just north of Taliban controlled territory) recent allegiance with the Islamic State. While the Taliban remains the dominant Islamist group in Central Asia, ISIS’s widespread use of Twitter has allowed the Islamic State to expand its influence in Afghanistan. In response to this recent surge of ISIS propaganda, one Taliban sympathizer tweeted “ISIS should declare a wilayet Twitter.” Indeed, ISIS’s skillful use of the website has allowed the group to expand into areas where it may not even have forces on the ground. ISIS’s efforts to discredit the Afghan Taliban are a part of the group’s larger goal of appearing larger than they actually are. Recent ISIS discourse on Twitter has focused on the group’s effort to expand into new regions, notably Central Asia and Africa. While the Islamic State has received pledges of allegiance from groups in Libya, Egypt, Nigeria and Afghanistan, the creation of new wilayets, or provinces, is greatly exaggerated on Twitter. A recent map of “ISIS provinces” asserts that the group is now governing large swaths of territory in eleven countries. While this is information is undoubtedly false, the map continues to reach a broad audience of ISIS supporters and sympathizers on Twitter. Maps like these are common on Twitter as they allow Islamic State sympathizers to exaggerate the group’s growth. Among areas of purported ISIS expansion, recent ISIS-aligned Twitter accounts seem to focus largely on Libya and Afghanistan. Aside from posting maps highlighting ISIS wilayets, group supporters consistently post information regarding Islamic State “governance” in areas controlled by ISIS-affiliated groups. A recent post praising the Islamic State for “fixing billboards” in the “Tripoli Wilayet” illustrates how group supporters exaggerate ISIS’s presence in places like Libya. The Islamic State knows that it does not control the entire city of Tripoli and its surrounding areas, but by claiming to “govern” in places like the “Tripoli Wilayet” ISIS can appear much larger than it actually is. Outside of its satellite wilayets in Central Asia and Africa, ISIS’s efforts to expand and govern in Syria are similarly broadcasted on Twitter. Amidst recent territorial losses and persistent fighting with regime forces in the province of Hama, ISIS sympathizers continue to assert that the Islamic State does indeed control the city and its surrounding areas. Recently, a prominent ISIS sympathizer account asserted that “IS declared [a] Hamah Wilayet [a] few months ago” similarly stating that the wilayet remained under the group’s control. Despite recent gains by Assad’s forces in the area, pro-ISIS Twitter accounts portray Hama as a stable and well-controlled province under the Islamic State’s control. ISIS’s efforts to broadcast “victory” in Hama represents a larger pattern of utilizing social media to emphasize the group’s unity and strength, even in the wake major losses on the ground. Analyzing jihadist social media activity offers valuable insight into the objectives and strategies of terrorist organizations. While this paper focuses on ISIS related Twitter activity, jihadist groups have established a presence on a variety of social media outlets from Facebook to Instagram. Twitter, however, is a particularly valuable source for jihadist discourse because of the website’s ability to provide constant updates/posts on the activity of groups like ISIS. On July 1st, Ansar Bait Al-Maqdis, ISIS’s Egyptian affiliate, carried out a series of attacks on Egyptian military forces in the Sinai, leaving hundreds dead or injured. 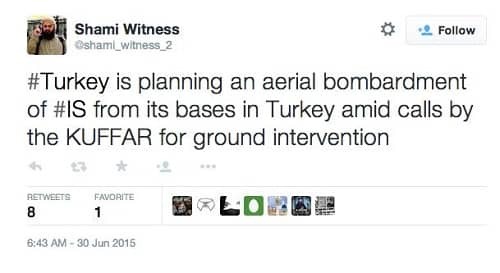 During the attack, @abu_ramzi00 was already Tweeting about the “success” of the Egyptian mujahedeen. @abu _ramzi00’s posts similarly asserted that these attacks were the start of Ansar Bait Al-Maqdis’ Ramadan operations in the Sinai. 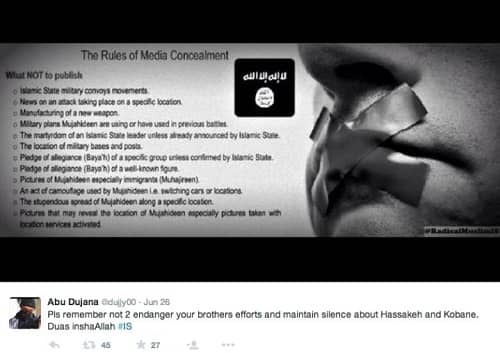 Despite a long list of purported rules for “media concealment,” ISIS supporters continue to offer valuable information on current and future operations via Twitter. Twitter does not only offer valuable insight into ISIS operations, the website has also become a busy forum for discussing ideology and tactics. ISIS sympathizers on Twitter continue to attack groups like the Afghan Taliban and Al-Qaeda’s Syrian affiliate Jabhat Al-Nusra, asserting that their organization is the “most-Islamic.” Without an official Islamic State website or news-channel, Twitter offers the most up-to-date information on ISIS’s operational and ideological agenda.